I can’t believe we’re almost halfway through May, already! Happy May 11h, folks. May 11th means… this weekend, we have TWO MORE markets starting up! We’ll be proudly attending the Moorestown and Flemington Farmer’s Markets! We’re looking forward to seeing all your familiar faces again. Just keep a eye on the weather. It doesn’t seem like Mother Nature doesn’t wants to cooperate this weekend. Fingers and toes are crossed! When you do finally make it to these markets, we have a slew of new products just waiting for you to try out, as well as a few more coming down the pike! National Apple Pie Day* – Take 10% Off our 5 in and 9 in Apple Pie, Apple Crumb, and Apple Blueberry Pies! If you’ve ever stopped in our store, you know all about our delicious Sweet Market Breads. Made from scratch daily, these breads are the perfect treat for anyone. Weighing in at roughly one pound, they’re made with only the freshest seasonal ingredients available. 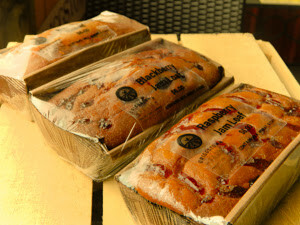 Currently, we offerBlackberry Jam, Strawberry Rhubarb Jam, Raspberry Jam, Banana Bread, and Jersey Fresh Blueberriesloaves. If you can’t make it to our store in Princeton, don’t worry! We’ll now be offering them at our Farmer’s Markets! Check out above for the list of Farmer’s Markets we attend! In a large nonstick skillet coated with cooking spray, cook chicken in 1 tablespoon oil for 3 minutes; drain. Add the mushrooms, water chestnuts and ginger; cook 4-6 minutes longer or until chicken is no longer pink. Drain and set aside. Spoon onto lettuce leaves; sprinkle with almonds. If desired, fold sides of lettuce over filling and roll up. Yield: 6 servings.